(Please call or text) My service is on a Reward basis... pay me what it's worth to you and what you can afford for me to find your lost item. 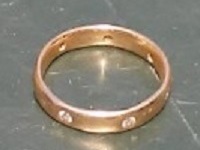 I have a call out fee starting at $25 if the ring is not found, this covers my fuel expenses. Where required, all searches are performed with permission by property owners and/or proper authority. Typically, permission is obtained by you and assigned to me. Any difficulties with permission to search said area, please contact me by phone or text message for assistance rather than email. Commercial, Industrial, Residential property searches, parks, schools, beaches, shallow water. Private person and/or Insurance claim searches for lost jewelry, valuables, coins, paper currency, items made of precious gems/metals....diamonds, topaz, emerald, gold, silver, platinum, ect. Skilled metal detectorist/treasure hunter available for property searches. Since the mid 1980's I've enjoyed the thrill and excitement of searching for lost treasure. This excitement is further enhanced when I receive a personal search request that centers around the research and recovery of lost valuables. Jonathan was truly a godsend! 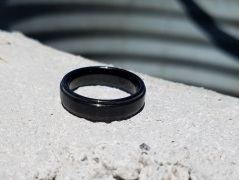 I never thought we would see my husband's wedding ring again, but from the beginning, Jonathan was confident that he would find it. 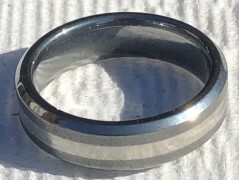 But, the odds were stacked against us: we were visiting downtown Detroit from out of town when my husband slipped and lost his ring at night, in a dark park, as it was snowing. To make matters worse, it snowed several inches overnight, making the search even more difficult. I randomly googled "Detroit ring finder" and am so glad it led me to Jonathan. It was truly a shot in the dark. I was desperate and not sure that it would work- but it did! Jonathan was quickly responsive and met us at the site to search within about an hour of our first contact. It was about 15 degrees outside, but he methodically searched the area, looking for the ring. Not only that, he went back later that day to search too! We left town, defeated. But Jonathan assured us that he would follow up and search the area once the weather broke. Imagine my surprise, when a week later, he text me that he was searching the site again and that he had found my husband's ring! I am beyond grateful for his service, and cannot recommend him highly enough! He was determined, professional and very courteous. He even helped coordinate a location to pick up that ring that was very accommodating too! It warms my heart that there are still truly good people in the world who are so willing to help others who are in need. Call him, you won’t regret it! 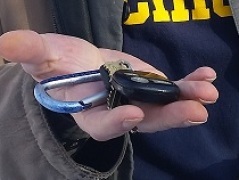 I lost my keys somewhere in the snow and found Jonathan online while searching for a metal detector service. I texted him and he responded immediately and was out to meet me within a couple hours. He helped me search in very deep snow even when I was ready to give up he didn't let me! And guess what? He found my keys!! What a lifesaver! He was also extremely nice and helpful and I was so grateful that I was able to find someone to help me! I would recommend him to anybody! I went into the fenced yard to supervise a water balloon fight with the kids. I hadn’t planned on getting wet, but my nephews attacked me and I ended up getting into the action. When we were all back on the patio, drying off as thunder boomed in the distance, I looked down and realized my ring was missing. Despite the downpour, the crew rushed back into the grass. A family member had videotaped the balloon fight, so my wife and a few others turned detective and looked through slide by slide trying to detect when the ring had come off. They managed to learn that I still had it on after getting hit by the balloons, but two minutes later, when I was up by the fence line, it wasn’t on my finger. Completely discouraged, I dropped to my knees and combed through the soggy clumps of freshly cut grass and raked my nails over dirt and god knows what else (they have a dog and we’d brought our puppy for the day).After an hour of searching, our shivering and drenched crew called it a night. It was getting dark and we were out of optimism. I drove the thirty minutes home, furious. By the time I got inside and changed, I hugged my wife and cried. That ring was the ring she gave me when we promised to love each other for all eternity. It was the single most precious item I owned, and it was gone. My wife immediately got to work. She researched ways to find rings in grass, or outside, and a number of other things when she found this website and zeroed in on Jon. Feeling guilty, she’d admit to me later, she dialed his number not caring that it was 10pm, or a holiday weekend. After they connected, Jon agreed—much to our delight—to come out the next day, on Memorial Day. We met with Jon back at my soon to be sister-in-laws and explained where we believed to have lost the ring. He spent thirty minutes going over the area, but didn’t turn up the ring. Figuring it must have come off during the action and traveled a ways, he went to look on the other side of the fence and found the ring within ten minutes. We really enjoyed hearing his stories afterward and getting to know him. This is his passion, and it’s an honorable one. The fact that he was willing, even eager, to take our late-night call and come out on a holiday speaks to his integrity. We kindly hope we never have a need for his service again, but if we do, we know we’re in good hands." You did a great job today! I was very stressed after having lost this ring, and clearly was in the dog house at home. I deserved it (I guess). I appreciate your availability and willingness to come to my home on relatively short notice. Watching your search process was very interesting, and it was clear that you have strong discipline in your process. You did a very thorough search and we were rewarded with success. Great job, and thanks so much for helping me find the way out of the “dog house” after a week. I enjoyed talking with you afterward, and hope you continue to have great success in your future. I’m the one who called to see if you’d be willing to come out. You went above and beyond driving out to assist us with the lost keys. 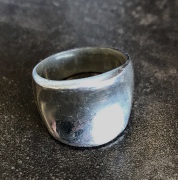 Thank you Jon for finding my sentimental silver ring in the snow! I lost my ring, it flew off my hand and landed somewhere in a patch of snow. I googled ring finder Detroit and to my surprise Jon’s name came up. 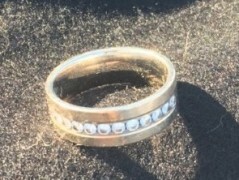 I thought why not call and see if he could help because the only way I’m going to find my ring in a couple feet of snow will be with a metal detector. He responded within 15 minutes. Very nice man, came over to where I was staying within the hour. Still didn’t know what to expect but was hoping for the best. Jon came and by the time I came back from my errand he found my ring that I had been searching all morning for. It was a very special ring to me and this incredible gentleman helped me reclaim a ring that belonged to my mother and when she passed I put it on. I cannot begin to thank Jon as well as let all of you know this is a real service and it is definitely a life saver if you are trying to find an item you really do not want to part with. I paid what I thought was appropriate and he concurred. Definitely grateful that he came so fast and was able to help me find something that continues to stay on my hand. Thanks again! He’s really great at what he does!! !